Comments: A medium to large-sized species, Iceland Gulls have pink legs and may show narrow, dark streaks on the tips of their primaries. Like Thayer’s Gulls, they nest in small colonies on arctic islands. In North America, they winter primarily along the Great Lakes and north Atlantic Provinces and States. Within the Great Plains, they are usually observed during the winter months on open water in the vicinity of dams. 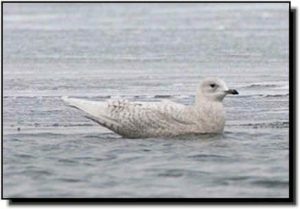 Iceland Gulls are most likely confused with Thayer’s Gulls and the larger Glaucous Gulls. Iceland Gulls occur in small numbers or are found only in localized sites within the Great Plains.